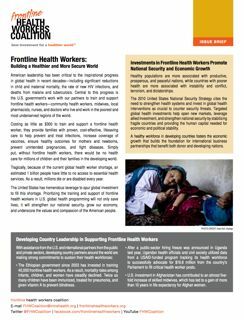 The Frontline Health Workers Coalition publishes briefs and fact sheets to highlight the need to invest more U.S. dollars in frontline health workers. Below are some of our key resources. 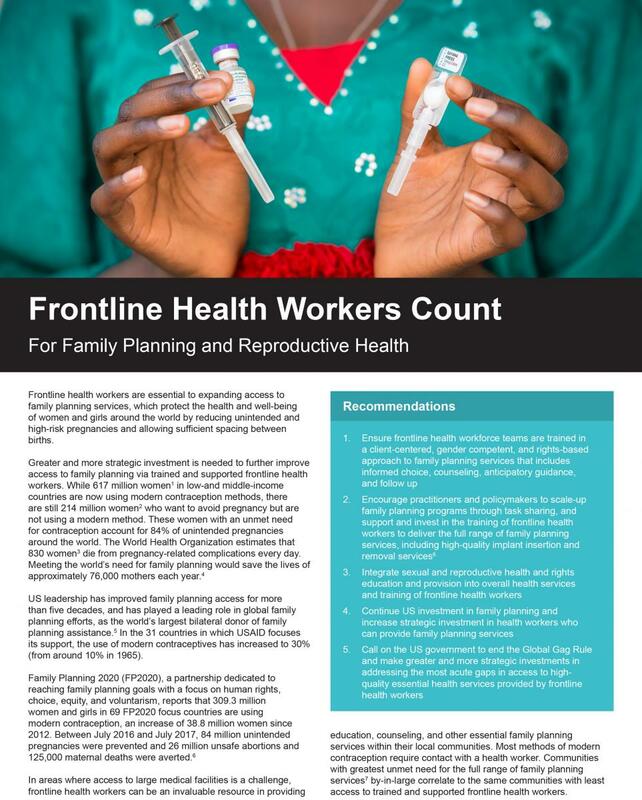 Ahead of the International Conference on Family Planning in Kigali, Rwanda, read our fact sheet to find out about the vital work that frontline health workers all over the world are doing in providing clients with informed contraceptive education and services, for an overview of the Global Gag Rule, and for our recommendations for strengthening the abilities of frontline health workers. 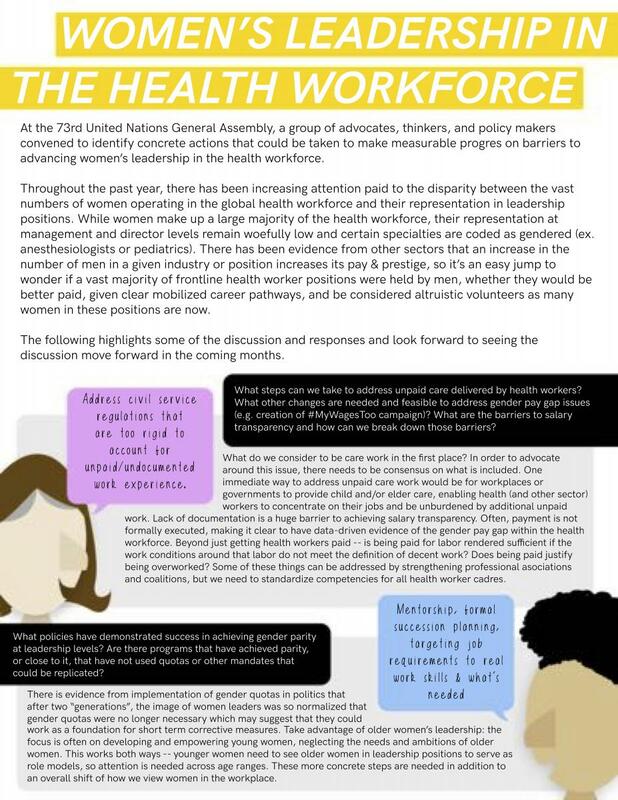 At the 73rd United Nations General Assembly, a group of advocates, thinkers, and policy makers convened to identify concrete actions that could be taken to make measurable progress on barriers to advancing women's leadership in the health workforce. Four recommendations for achiveing universal health coverage and primary health care for all: prioritize the milestones in the Global Strategy on Human Resources for Health, unlock new, multi-sourced invetment in the global health and social workforce, make financial commitments to mechanisms such as the Working for Health Multi-Partner Trust Fund, transform health workforce education. 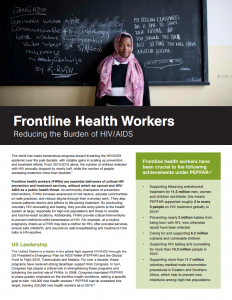 Our updated set of issue briefs outlines how frontline health workers impact core US global health priorities, including the pursuit of an AIDS-free generation, the elimination of preventable maternal and child deaths, the advancement of global health security, and more. 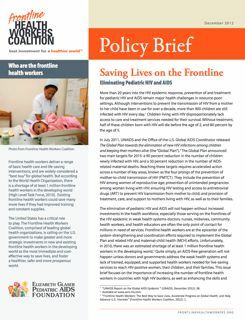 These briefs highlight the unique and critical role of frontline health workers in tackling specific global health issue areas, as well as U.S. leadership on these issues and the need for a comprehensive US health workforce strategy to further advance global health progress. To optimize the role of community health workers (CHWs) in expanding equitable access to health services and meeting the SDG targets, country governments—with support from their global and local partners—must improve data on CHWs to gain the necessary information to strengthen support, planning, and decision-making. 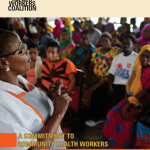 In a policy analysis released in November 2016, the Frontline Health Workers Coalition calls for governments and all stakeholders to come together to advocate for and deliver the data on health workers, including CHWs, that will foster the enabling policy environments and programs needed to address the most severe access gaps. 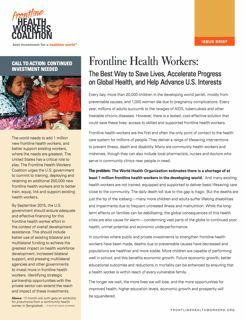 The Frontline Health Workers Coalition recommends that the U.S. Government and its partners address the public health emergency resulting for the Ebola virus epidemic in Liberia, Sierra Leone, and Guinea by investing in the training, retention, and support of frontline health workers. 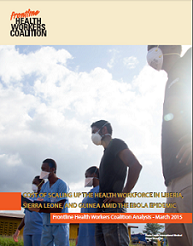 Based on the assumptions, data and calculations in this report, the overall cost of doubling the health workforce over five years in Liberia, Sierra Leone, and Guinea, and expanded coverage via a community health worker program comes to approximately $573.4 million, or less than $115 million per year on average. To read more about this costing analysis please see our full report. 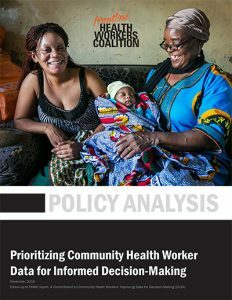 Community health workers (CHWs) have emerged as critical human resources able to deliver health services directly to communities, including services that could prevent the majority of child deaths. To meet immediate health needs, to achieve the Millennium Development Goals (MDGs), and to achieve universal health coverage (UHC), integrating CHWs into functional health systems is an urgent necessity. Frontline health workers are integral in providing available, affordable, and culturally acceptable health services, especially for communities in hard-to-reach areas. 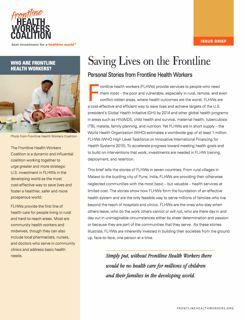 Frontline health workers not only provide necessary medical treatments, they also save lives by encouraging healthier living through preventative care and health education. 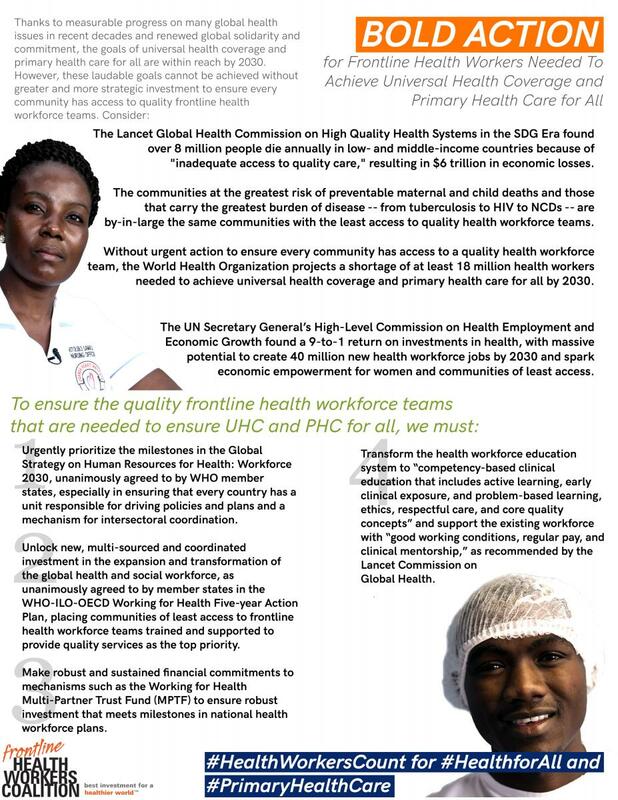 Without frontline health workers universal health coverage for all would not be possible. 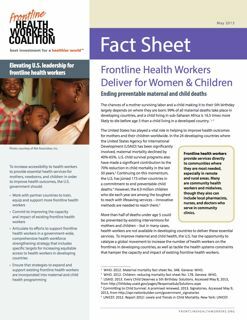 This factsheet highlights how the U.S. Government’s leadership and investment in global health workforce strengthening has accelerated progress on numerous health goals. Prioritizing investments designed to fill the persisting shortage of health workers in many areas is the next step in achieving these goals. Although interventions to prevent the transmission of HIV from a mother to her child have been in use for over a decade, more than 900 children are still infected with HIV every day. The elimination of pediatric HIV and AIDS will not happen without increased investments in the health workforce, especially those serving on the frontlines of the HIV epidemic. 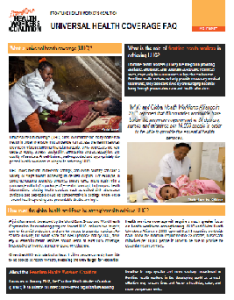 This brief tells the stories of frontline health workers in seven countries. From rural villages in Malawi to the bustling city of Pune, India, FLHWs are providing their otherwise neglected communities with the most basic – but valuable – health services at limited cost. The devastatingly large global health workforce shortage, combined with health workforce utilization, training, and equipment issues, greatly contributes to preventable deaths worldwide. Increased investment and integration of the health workforce will help frontline health workers throughout the world save lives.